Other fluids are just green with envy. Featuring an advanced formulation powered by Dow Technology. Genuine Sullube® is a long-lasting fluid that prevents the formation of varnish - the leading cause of air end failure - and keeps your compressor running exceptionally clean and cool. 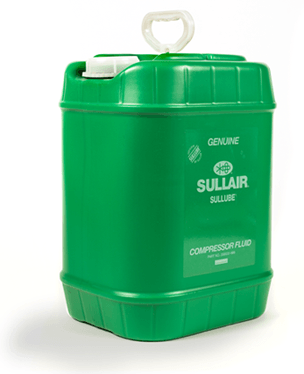 Sullair has always maintained that lubricants are the lifeblood of its compressors. Inspired by this challenge, we’ve earned a position of leadership in fluid technology by spearheading the development of lubricants that extend service life, improve economics and maximize equipment performance. To learn more about the lubricants Sullair offers, contact your local Sullair distributor. Varnish is the leading cause of air end failure. Sullube dissolves existing varnish and sludge buildup, helping keep your compressor clean and protected. High compressor operating temperatures affect the fluid life and can cause costly shutdowns. Sullube has a high thermal conductivity that stabilizes operating temperature in any climate. Less top-off is necessary. With one of the lowest carryover rates in the market, Sullube is a quality cost-saving solution. Sullube generates environmentally safe biodegradable condensate for easy disposal. Sullube’s viscosity index allows it to operate efficiently while it protects your compressor’s air end, even in temperatures up to 200°F. Sullube® optimizes factory safety with one of the industry’s highest flash points.